The Common Entrance Exam in Delhi is going to conduct Entrance Exam. 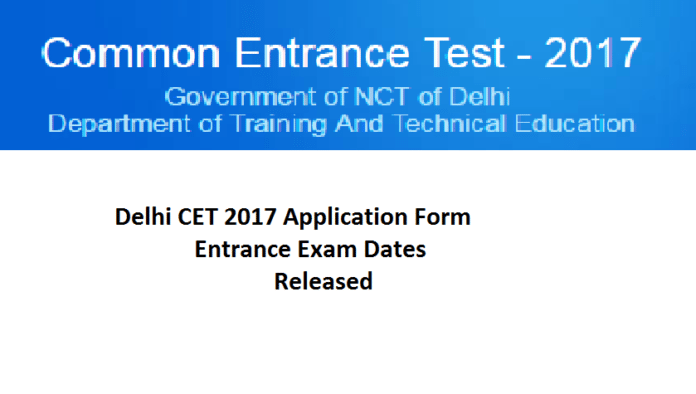 Now, they have released Delhi CET 2017 Application Form. Students seeking admissions for Diploma courses in Engineering & Non-Engineering can check the Delhi Polytechnic Exam Eligibility at cetdelhiexam.nic.in. Authorities will accept application through online from 20th March 2017 to 20th April 2017. Candidates have to check out eligibility details and then only register for Entrance Exam. Admissions will provide Polytechnic disciplines offered at AICTE approved Government Polytechnics, Delhi. Delhi Common Entrance Test (Delhi CET) is an Entrance Exam conducted for full time Diploma courses in Engineering/Technology are offered at different AICTE approved Government Polytechnics, Privately Managed Polytechnics and Government Aided Institutions affiliated to the Board of Technical Education, Delhi. The exam will conduct on 27th & 28th May 2017. Well coming to the necessary details, candidates have passed the 10th or Equivalent exam with Science, Mathematics & English subjects can download Delhi CET 2017 Application Form through online at cetdelhiexam.nic.in. The admissions will provide basing on Entrance Exam Score. Registration process starts from March 20, 2017. Refer information brochure and check respective Delhi Polytechnic CET 2017 Exam Dates. The processing fee is Rs.400 plus Rs.18 additional charges that can be payable through credit, debit or net banking. Delhi CET Application Form Correction 2017 facility shall be provided through online mode. Students seeking admissions for Polytechnic Programmes can hit on the link to Delhi Common Entrance Test Apply Online 2017 through accessing official web portal at cetdelhiexam.nic.in and submit an application before April 5. Test 1: Admission to Engineering/Technology based Diploma courses and occupational courses. Test 2: Examination for Modern Office Practice (English) course. Test 3: Examination for Modern Office Practice (Hindi) course. Test 4: Examination for Diploma courses in pharmacy. Test 5: Examination for Lateral entry in Diploma courses. Get Latest Updates from techfactslive.com and even information regarding Recruitments, News, Admissions, etc will provide in this web.